French foreign exchange students (from left) Octave Boileau , Ambre Clerc, Colin Ducerf, and Maxime Tuet, interact with each other alongside other Seven Hills School students during a P.E. period last week. 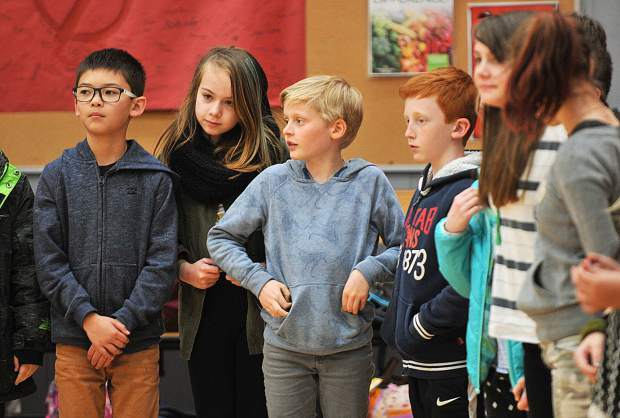 On April 6, 13 fourth- and fifth-grade exchange students from Lyon France arrived in Nevada County. The students are accompanied by their two teachers and are staying with local host families from Seven Hills and Deer Creek. Last year, Alicia Funk partnered with a French nonprofit organization called Ligue de L’Enseignement (League of Education). She then teamed up with the principal of Seven Hills, Sam Schug and Deer Creek, Monica Daugherty to arrange for the exchange students to stay with fourth- and fifth-grade host families and shadow students in their classes for two weeks. Because exchange programs in middle schools are not as common as they are in high school, educators at Seven Hills and Deer Creek are excited to give their students the opportunity to interact with children from another country, learn more about French culture and gain a more global perspective. Although the schools that send the students are bilingual and teach the students English, some are more fluent than others. It can be difficult for the students to communicate at first but, according to host student Judah Cost, it gets easier. On some days, the students shadow their host students, or “correspondents,” as the program calls them, but on other days, the students go on fun and educational field trips to locations around Nevada County like Camp Augusta and the Firehouse Museum in Nevada City, gold panning on the Yuba river and taking a walk on the Tribute Trail in Nevada City, all planned by Funk. Last year at Seven Hills, the French students helped in a school-wide tree planting to replace some of the fir trees surrounding the school. Through these experiences, the French students get a glimpse into the life of students from the United States. According to Fifth-grade French student Ambre Clerc, American school is different from French school because students are allowed to eat on the playground and use computers. Despite their differences, many of the students finish the program having built a strong relationship with their exchange student. Judah plans to keep in touch with his exchange student through Skype even after they return to France. In fact, several families who hosted exchange students last year have already visited them, and a few more plan to do so this summer. Eventually, the schools hope to send a group of students to France as part of the exchange program. Mia Belluomini is a student at Sierra Academy of Expeditionary Learning and intern at The Union. Contact her at ncpcintern@theunion.com.